I may lack the exceptional abilities of some heads of state when it comes to estimating crowd size, but the attendance at this year's Rocky Mountain Audio Fest looked pretty robust to me. 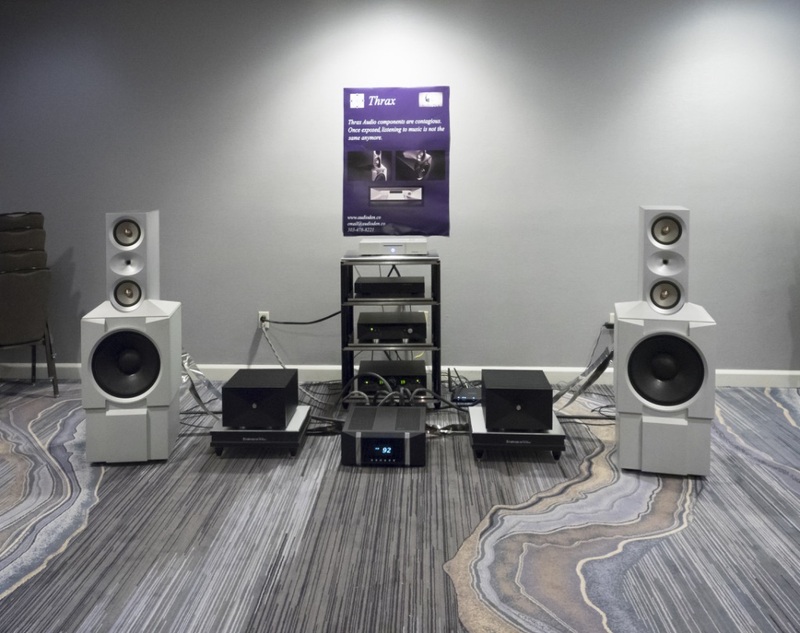 With the refurbishing of the Denver Marriott Tech Center finally complete, the setting for this popular show has a more upscale feel, the kind of destination you might have a shot at convincing a non-audiophile into coming along to. It seemed to me that I was seeing more Significant Others and even kids ("Don't touch that beryllium tweeter, honey!") roaming the hallways and other common spaces of the thirteen floors that accommodated RMAF 2017. There were, of course, a dizzying number and variety of loudspeakers to be seen and heard, and a good number of them were new—that designation ranging from "Mk 2" versions of established models to products so fresh that a price hadn't been settled on, even though they were shipping before year's end. All the speakers noted in this report are "new" so, manufacturers, if your product isn't here, it doesn't mean I'm dissing it (or you). It means the speaker wasn't actually new, or I made a mistake, for which I apologize. Trends? The recent phenomenon of the WAMM notwithstanding, maybe we're seeing some movement away from massive systems. Or perhaps more interest in having DSP built into a loudspeaker to deal with the environment it's going to be living in. Mostly, I was as impressed as ever with the seemingly endless imagination manifested by both veteran designers and new players. Iron speakers, anyone? The most elegantly choreographed product introduction happened at 8:30a.m. 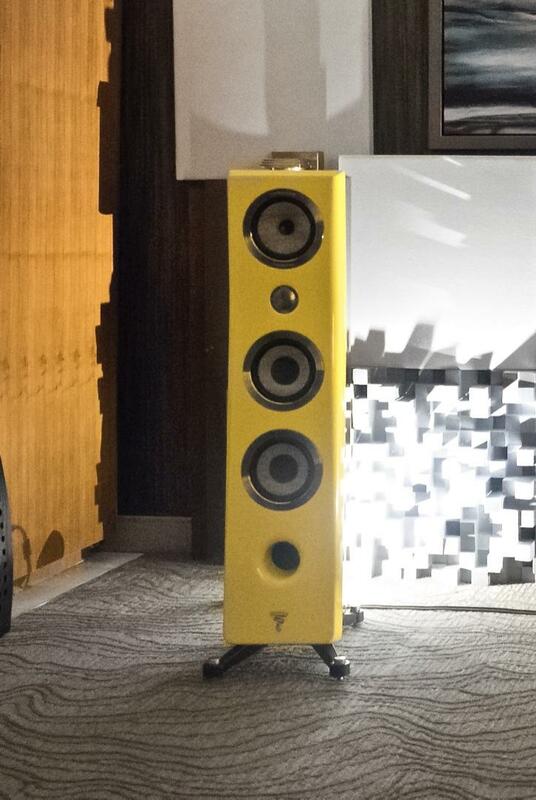 on the first morning of the show when Focal unveiled (literally) the Kanta N°2 ($10k/pr.). The Kanta line fits between Focal's Electra and Sopra ranges; currently, the only speaker in the series that's available is this four-foot-tall floorstander. After several slick videos and brief speeches by trim French guys in good French suits, the presenters moved to a line of shrouded rectangular boxes and, like a team of waiters in an exclusive (French) restaurant removing the silver cloches from your table's entrées, the loudspeaker—in a variety of colorful high-gloss as well as wood veneer finishes—was revealed. The Kanta N°2 is a three-way bass-reflex design with an inverted beryllium dome tweeter (engineered to optimize airflow and eliminate backwave issues) and a pair of 6 ½" flax woofers that are 35% thinner than the comparable driver in the Sopras, yet have the same rigidity. The Kanta's nominal output impedance is 8 ohms and the sensitivity a healthy 91dB. Driven by Naim electronics and connected up with AudioQuest cables, they impressed with large-scale music of all sorts. The Wilson Benesch Cardinal loudspeaker—at $114,500, the company's flagship product— made its North American debut. 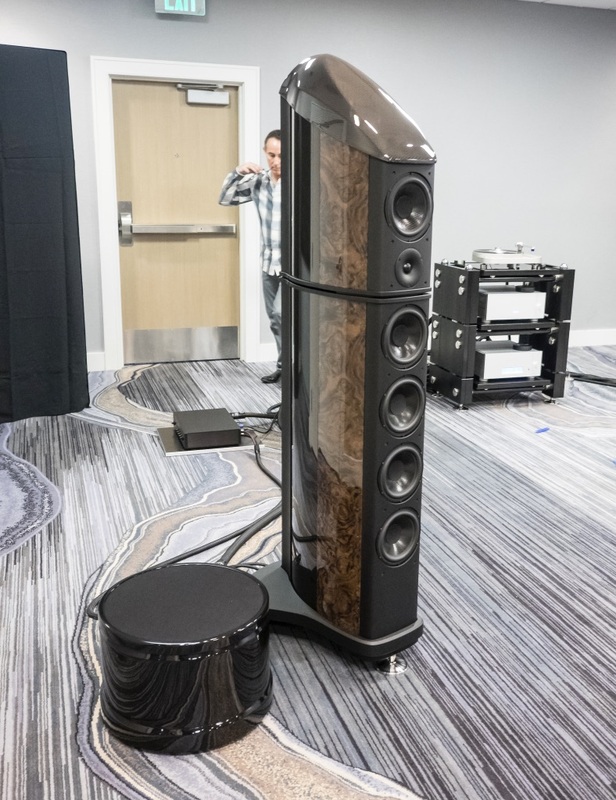 As with the Wilson Benesch Evolution One P1 Ettore featured last year at Rocky Mountain, the enclosure is fabricated in part from a carbon fiber material; the front baffle, however, is a substantial piece of extruded aluminum to which six drivers are attached—a "Semisphere" silk dome tweeter and five 170 mm cones that may look alike, but actually represent four different cone/motor implementations. 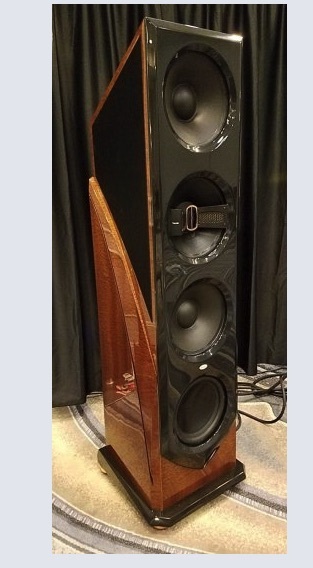 A pair of Ypsilon Hyperion amplifiers ($93,000) drove the Cardinals very effectively. 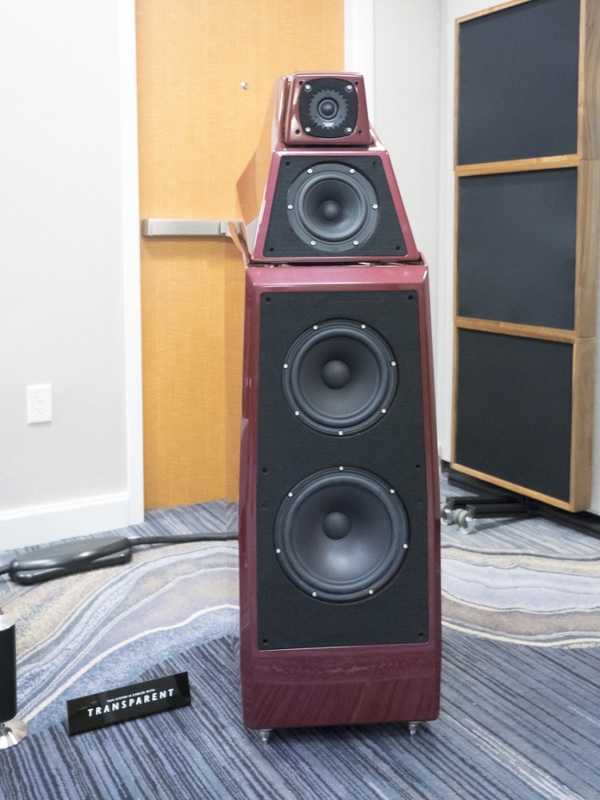 The capacious room that Aaudio Impact, WB's U.S. importer, had secured for the Cardinals assured the most "epic" musical presentation of any system at the show. 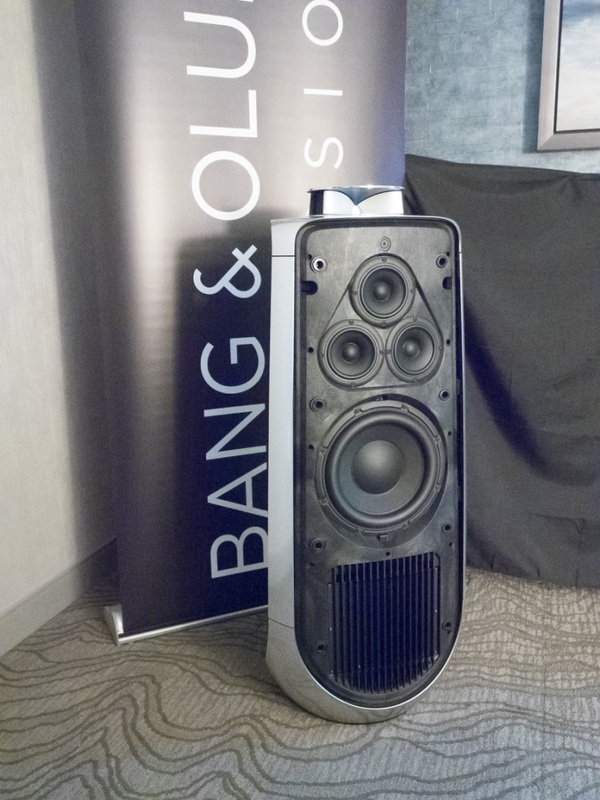 In a more typically proportioned hotel room, Bang & Olufsen demonstrated its new BeoLab 50 ($39,200). The speakers were visually distinctive yet capable of blending harmoniously with any number of decorating styles. The price is a good value, as all the required amplification is provided (each speaker contains seven 300-watt digital amplifiers to drive a tweeter, three midrange cones, and three woofers) as well as DAC/preamp functionality that's navigable with a B & O television, a phone, or a tablet. The user provides digital input to one loudspeaker via USB (24/192), SPDIF (24/192), or an optical input (24/96); you don't even need speaker cables, as one speaker controls the other wirelessly. An extremely sophisticated form of DSP room correction is built-in as well. Operating the "digital lens" feature of the tweeter optimizes the musical experience for either one person in the middle or a group of listeners positioned lateral to the "sweet spot." The Legacy Audio modus operandi at RMAF has been to book a ballroom and set up several systems in the space to be demonstrated sequentially. There was a great deal of attention to the new VALOR ($80,000) designed by Legacy founder Bill Duddleston. The VALOR and other Legacy models employ a unique form of DSD room correction that requires one to take measurements right in front of the loudspeaker, rather than at multiple locations around the listening position. For calibration, that data is transmitted to a supercomputer in Sweden, which crunches the numbers and returns an algorithm that's installed on an owner's Legacy Wavelet ($4950, included in the price of the VALOR) that also has a top-drawer DAC chipset and preamp-like control functions. The VALOR is a large four-way, eight-driver system that includes an unusual dual 4" AMT bridge-mounted tweeter and, at the other end of the frequency spectrum, a subwoofer harnesses the output of two 12" aluminum diaphragms with 480 oz. motors. Within each enclosure, there's 2750 watts of amplification. 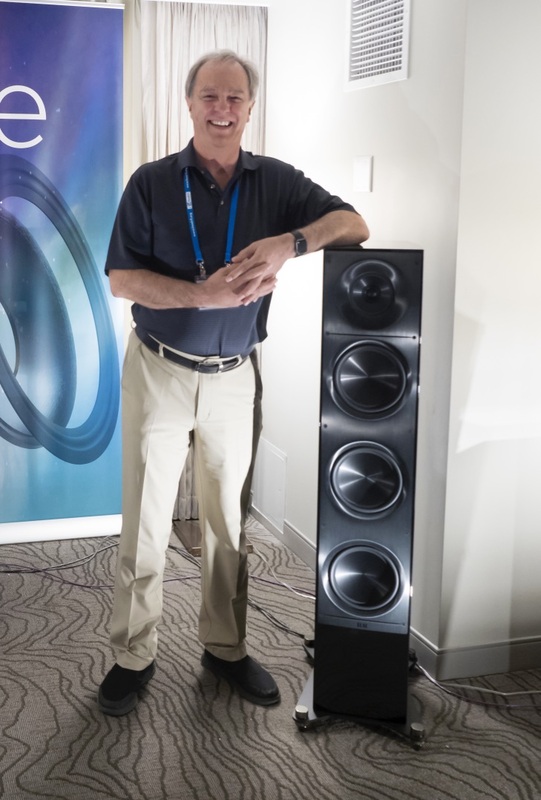 Over the past few years, Andrew Jones has definitely gotten our attention by designing and manufacturing speakers that redefined what was possible in a transducer retailing between $200 and $1000/pr. ELAC's new Adante line—the AF-61 ($5000) was premiered at RMAF—is what Jones calls "entry-level high end." The AF-61 is a three-way with an "interport coupled cavity," meaning that the business woofers (three 6.5" aluminum cones) are inside the enclosure while a trio of 8" passive subwoofers (also aluminum cones) face the outside world. The 1" soft-dome tweeter is mounted concentrically within the 5 ¼" aluminum midrange driver. With ELAC Alchemy DPA-1 monoblocks ($1595 each) and other Alchemy electronics upstream, the sound was confidently dynamic, detailed, and tonally accurate with excellent bass clarity. Wilson Audio Specialties' Alexia Mk2 ($58,000) is the first regular production Wilson loudspeaker to incorporate technology that's trickled down from the mighty WAMM. Precise time-alignment has always been Wilson's key design principle, and the tweeter module on the new Alexia can be adjusted more finely and reliably than before. The tweeter and midrange enclosures are both significantly larger, as well. Two visits to hear the speaker over the course of the show convinced me that the Alexia Mk2 may well occupy the sweet spot of the entire Wilson range, when it comes to price/performance considerations. I wasn't kidding when I referred, above, to iron speakers. Ole Lund Christiansen started Gamut, built it into an international success, and then sold it. His current enterprise is JERN (that's Danish for iron) and, yes, he makes the enclosures for his diminutive loudspeakers at a foundry not far from where he lives in Aars, Denmark. The more expensive of the two models (the "cabinet" is the same for both) is the JERN14 ES, a two-way that's supplied with a REL T/5i subwoofer bolted to a 50 lb. slab of…you guessed it…iron—all for $5000. The sound was detailed, neutral, and huge. I've got to hear these again. Speaking of Gamut, Zodiac ($149,000), that company's flagship, is finally shipping. From Janis Ian (Breaking Silence), to Beethoven (Symphony No. 6) to a direct-to-disc Glenn Miller big band album, this was not an easy room to leave. 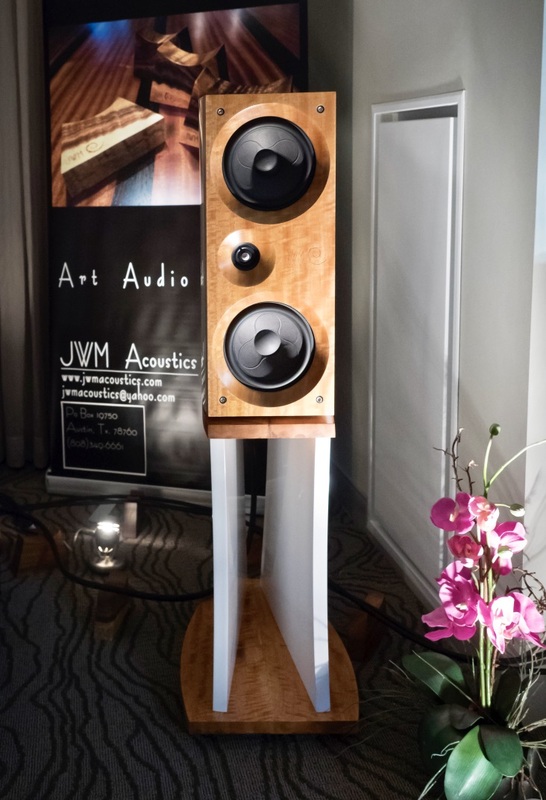 As was the case last year, the most attractive loudspeakers at RMAF were from the Hawaiian company JWM Acoustics. Joshua Miles continues to build them from a variety of exotic hardwoods—Monkeypod, Mango, Sapele, and many others—but has acknowledged that the wide variety of enclosure materials employed could potentially result in different sounding examples of the same model. With the Alyson AML II ($8500), the drivers are all attached to a composite-material baffle to reduce such variability. I heard impressive dynamics, accuracy of instrumental color, and excellent soundstage depth. Rosso Fiorentino, from Florence, Italy, has a large product line. A new stand-mounted model is the Fiosole ($7500, with stands). The speaker is a highly detailed and balanced performer. Ah, youth! 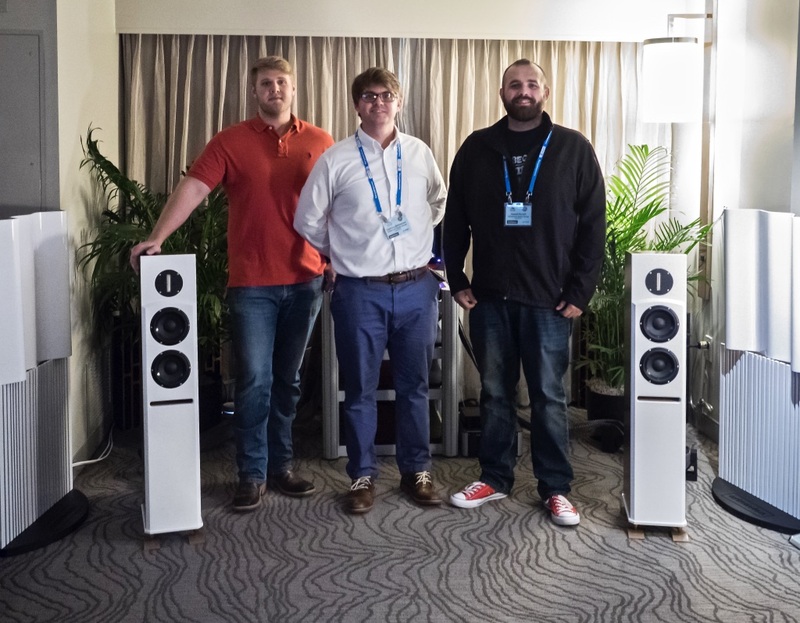 The $6985 Vehement Audio Brezza Savant floorstander was presented by CEO Zachary Bohannon and Chief Technical Officer Justin Reynolds—friends since they were teenagers—plus Vehement's Chief Operations Officer and master builder Daniel Dortch (see photo). High frequencies were handled by a RAAL 64-10 True Ribbon tweeter and below are two custom-made SEAS 6" woofers. The transmission line cabinet produces a +/- 2dB point of 45Hz. What I heard seemed predictive of the best kind of long-term listenability. The new X-5 series speakers from Raidho range in price from around $32,000 to about $47,000, depending on finish and the kind of driver membrane the customer opts for—ceramic ("X") or Titanium ("XT"). I heard the XT-5s: Vocal sibilants were very well controlled and string/wind textures were quite natural on a Shostakovich symphony file I'd brought along. The Spatial X2 ($9620) is an open-baffle loudspeaker combining a horn-loaded Air Motion driver (covering 800Hz upwards) and a 15" Acoustic Elegance woofer that promises "low frequency detail down to a subsonic 18Hz." The crossover is passive. You really can't appreciate how much most box speakers color the sound of music until you've heard a design like this one. 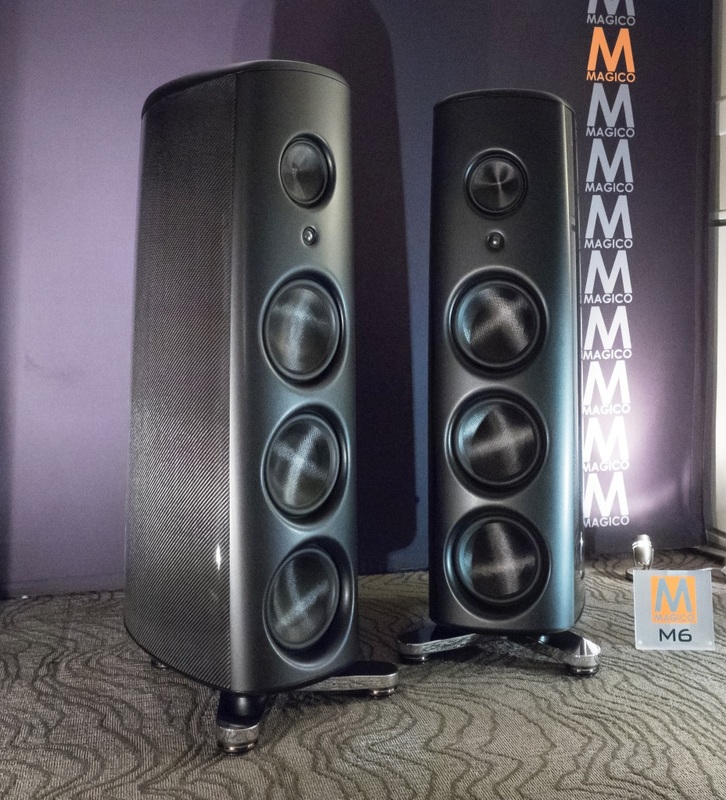 The biggest disappointment of the show was not being able to hear the new Magico M6 ($172,000). Magico typically books a spacious suite at the nearby Hyatt to demo their large loudspeakers; they got booted and it was too late to get a suitable room at the Marriott. So showgoers could only gaze longingly. Magico has invited one and all to visit the Hayward, California headquarters on two days in early December to hear the M6. Other debuting speakers ranged in scale and cost, from the cute little red MarkAudio-SOTA Tozzi desktop mini-monitors ($495) to the imposing but beautifully crafted Daedalus Audio Zeus (price TBD). Other smaller newcomers, at a relatively modest price, included the Harberth 30.2 ($6495), QCN Signature 3 ($7500), Audio Kinesis Azel ($7000), and Neat Acoustics IOTA Xplorer (TBD; $5000-$5500 estimated)—the last an innovative two-and-a-half-way that employs an AMT (Air Motion Transformer) tweeter and a sealed iso-barik woofer system. The Alta Hestia ($32,000), described as "a new form of transmission line," was heard with Frank Van Alstine's electronics, playing Mahler's Seventh with command and ease. Thrax introduced its Basus woofer ($40,600), designed to accommodate that company's Lyra loudspeaker on top of its enclosure. Two musical experiences made the weekend especially satisfying. First, audiophile pianist Robert Silverman performed on several occasions in one of the first floor ballrooms. One evening, just as the show was wrapping up for the day, Silverman played a short all-Chopin program, mostly drawn from a new IsoMike recording, available on vinyl, titled Chopin's Last Waltz. I sat about eight feet from the Steinway concert grand and could feel the stress of ten hours of frantic loudspeaker auditioning melt away. I was very glad that I was done listening to speakers for the day. Finally, to the pleasure of many, Classic Album Sunday was back for eight "in-room seminars" at RMAF 2017, meticulous presentations in an audio-optimized setting of recordings of musical importance that…well, never sounded so good. This year's offerings included Sgt. Pepper's Lonely Hearts Club Band, John Coltrane's A Love Supreme, Dark Side of the Moon, Radiohead's Kid A, and several others. I went to the Carole King Tapestry session. Moderated by Sam Willet, the young but musicologically wise producer of CAS Chicago, a roomful of lucky souls who knew the record very well freshly experienced King's 1971 masterpiece and were moved and energized—myself included. Best Sound (Cost No Object): Sometimes the familiar names are the best—especially when they keep getting better. The Audio Alternative room featured Vandersteen Audio speakers—Model Seven MkII plus Sub Nine subwoofers—VTL amplification, a Brinkmann turntable and DAC, and AudioQuest wires and power conditioners. The retail value of the complete system was headed towards $500,000 when I put down the calculator. Best Sound (For the Money): For several years there's been one name that comes up again and again which is, of course, ELAC. 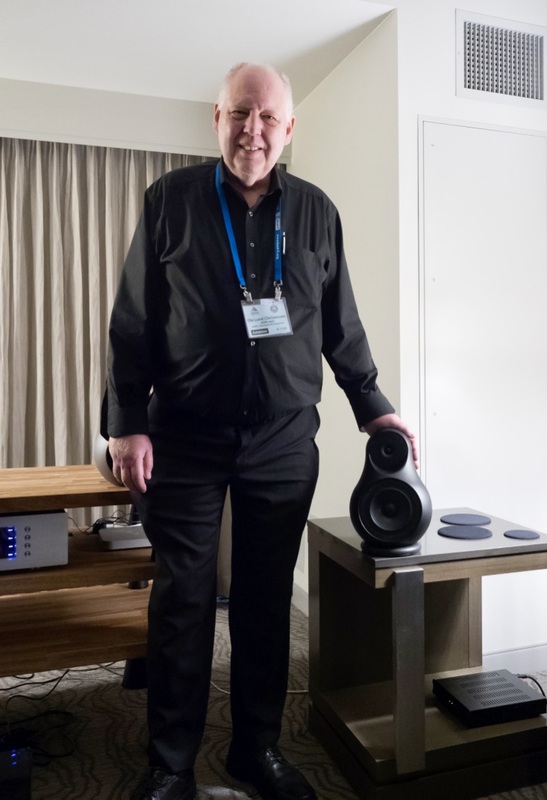 This year, designer Andrew Jones set his sights on "Entry-Level High End" with the Adante AF-61 loudspeakers. 5000 dollars gets you a lot of good sound when they're ELAC dollars. Most Significant Product Introduction: Put me down for the Legacy VALOR loudspeaker, with its outside-the-box approach to room correction. Most Significant Trend: "Modular" electronics were offered by several manufacturers. You get just what you need—DAC, phonostage, "control" capabilities, room correction, digital interfaces, network player, etc. Most Coveted Product: JWM Acoustics Alyson AML II. It's not that I can't afford them—I just wish I had a place to put them. Maybe a house in Maui? No, my affection for these Hawaiian beauties will remain a fevered dream.